I had whole-heartedly intended this top to be a sorbetto. Not many days pass when I don’t see someone sporting a new version of this nifty and versatile little tank. It even had the balls to push the Big 4 out and claim the #2 spot in Pattern Review’s Best Patterns of 2012 – the first time an Independent Pattern has made it onto this list! Nice work Colette Patterns. But when I made it up in calico, I just couldn’t see myself wearing it. According to the 12 shapes of Trinny and Susannah, I’m a Goblet, (You can take their quiz here, then check out the recommendations for your shape here), which means no clothes with baggy midsections for me. And the Sorbetto was super baggy on me – even with alterations. …but named the Caramel Slice because I made the rooky error of gobbling down the most amazing piece of caramel slice EVER (lovingly made by Mr. poppykettle of course) at the same time as trying to sew a seam. Unfortunately this meant my fabric came into contact with the delicious delight in my hand. Though I am rather pleased that my fagotting withstood a spin in the washing machine! The fabric of choice? 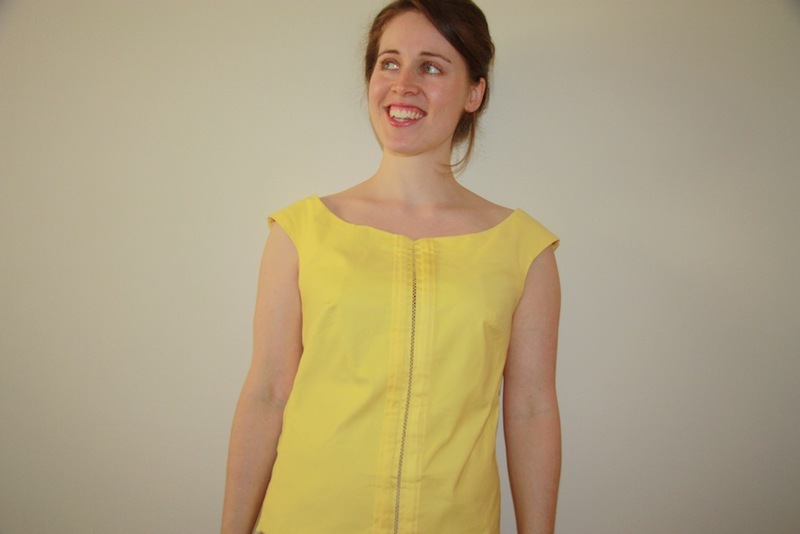 A stretch yellow cotton from Tessuti. 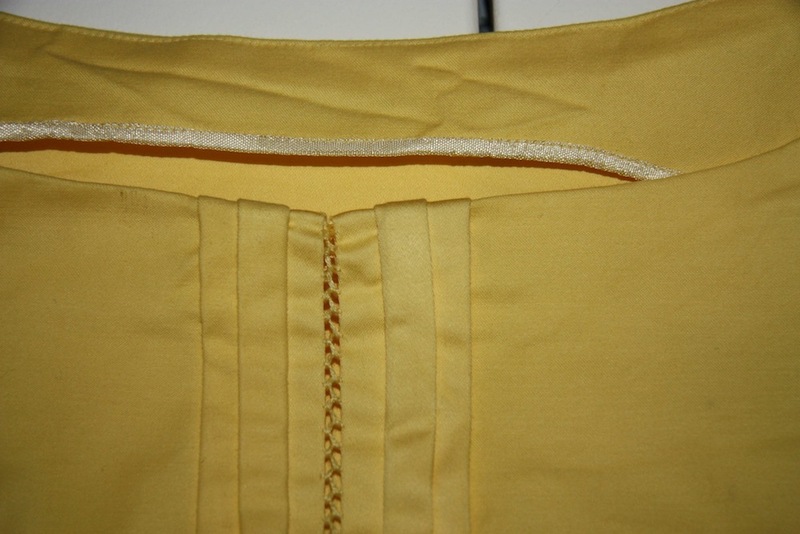 This pattern definitely does work better with a more drapey fabric, rather than something as structured as this. But it’s still wearable. I was absolutely blown away by Lizz’s fagotted sorbetto with pleats, which you can see here on her blog, A Good Wardrobe. So this top is an ode-to-Lizz! Imitation is the highest form of flattery? 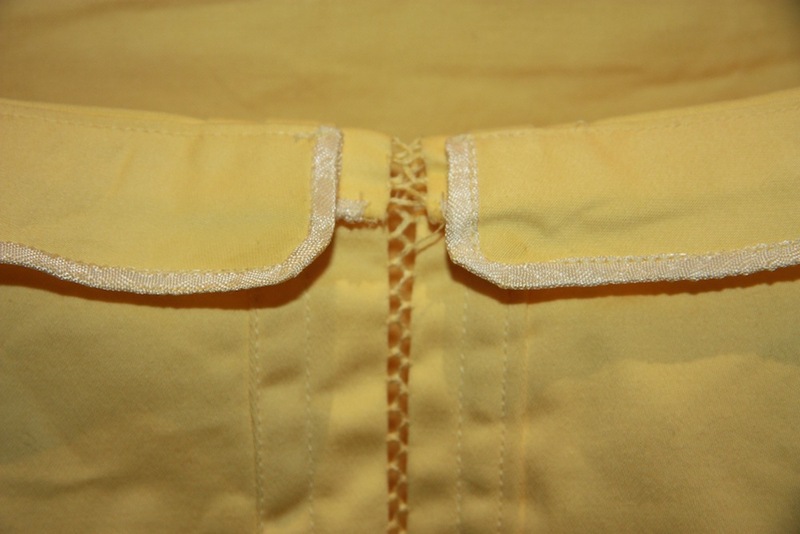 I used the same off-white rayon seam binding on the insides, which I love the look of. Hand sewing this seam was a very relaxing experience – you can see my 101 on how to do your own hand-sewn fagotting here. It's so delicate and lovely! And yellow really looks great on you. It's really pretty and I would love to try my hand at Fagotting one day. You look great in yellow. It is fantastic! I love the fagotting stitch. I've made 3 sorbettos, but my last one is not very wearable – it is too baggy and makes me look much larger than I am. Go you! That fagotting stitch is so well done! I'm intrigued about this shape quiz too. Oh, thankyou Lisa! You definitely should – it's surprisingly sturdy and beautiful at the same time. Really? All the ones I've seen you in have always looked lovely. I just couldn't see myself wearing the sorbetto, thank goodness for muslins! Yeah, it was interesting – I've never watched them (Trinny and Susannah) much on TV but from what I have seen, they've always done really well with their makeovers. 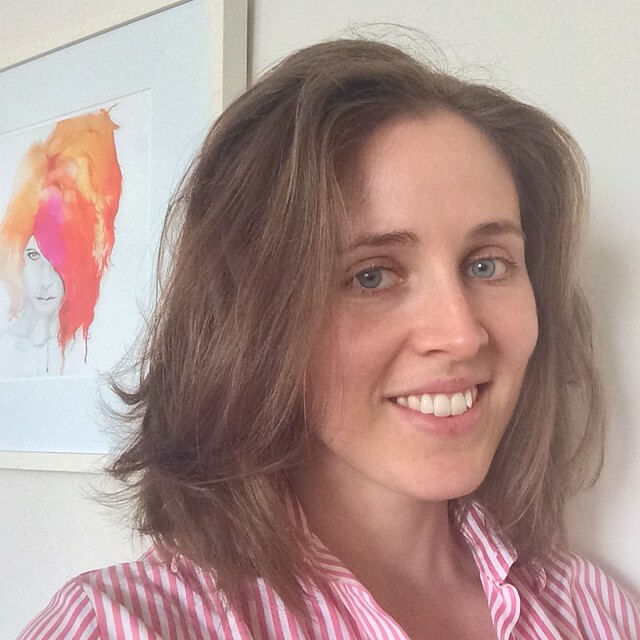 A friend sent me the link – and the results resonated with me, so I'm happy to take on the advice! Great colour. Yellow is so happy! I love all your details. The fagotting is very impressive. Super cute! Love the color, and the fit around the shoulders looks great. Thanks! I made a white one recently that I haven't blogged about for that reason. The other ones are great though. Am really loving 'yellow' at the minute. This colour and design really suits you. I've just learn another stitch – thank you. The yellow is perfect for you and the beginning of spring. I love the fagotting and have been dying to try your tutorial you posted not long ago. Thanks Bernice – I know, I can't help but feel a little lifted when wearing such a happy colour! Thankyou! The shoulder fit is why I really love this pattern. I feel so 'elegant' when wearing it! Thanks Madalynne! I really really like this stitch – so I'll definitely be incorporating it into something else in the future! 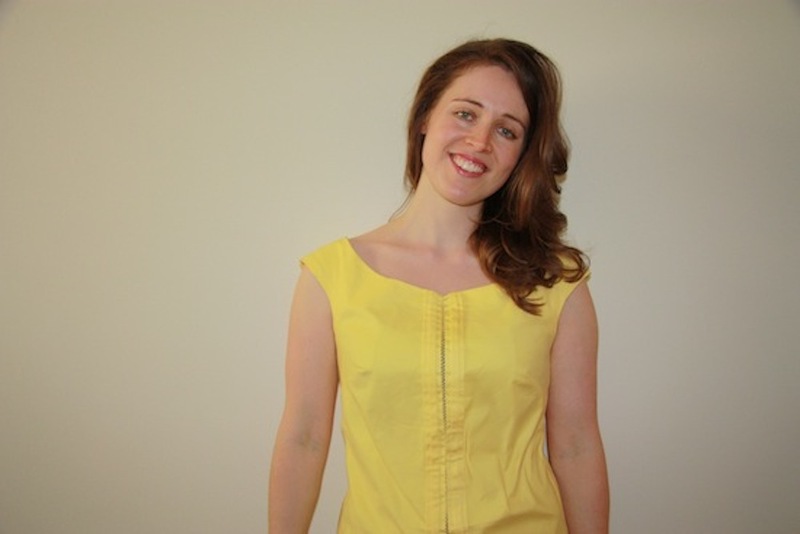 My favorite thing about this cute top is the color – that yellow is just spectacular on you. And, of course, the beautiful fagotting, plus the elegant neckline make it very pretty, too.Nice work! ooooh I love that center detail! and the color!I looked at that quiz link – man, some of those descriptors are harsh – I don't think I've ever heard someone described as a brick or a skittle. What shape would a skittle be anyway? A circle??? I guess I'm a cornet. So, apparently in 3/4 sleeves (which I'm wearing right now) I look like a gorilla in a shrunk top! The fagotting is beautiful! 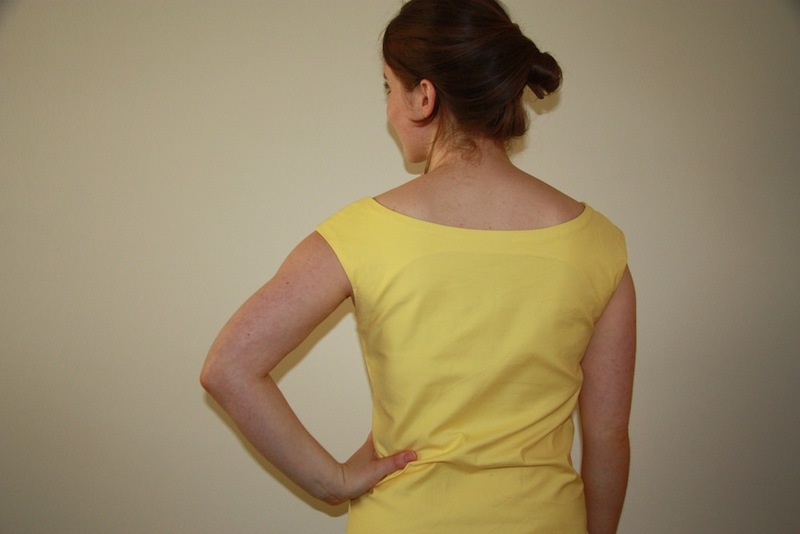 And so is the lovely neck and shoulder line. It's gorgeous! That color on you is beautiful and I love the neckline. I'm so flattered you like my blouse. After I made my sorbetto, I wanted to do fagotting on everything! It was quite fun. Gorgeous! I love this! You look great in yellow!